Seventy-four years ago on February 26, 1935, experimental work conducted in Britain demonstrated that aircraft could be detected by radio. The history of this discovery and its vital role in Britain’s defence in 1940 and the following years has been told many times. But what of the observers, working calmly with evolving equipment, and always in danger of enemy attack? My sister, Jean Semple (nicknamed Sally), was one of the first service-women in Radio Detection and Ranging, as Radar Technology was originally known. After joining the WAAF on March 20th, 1940, Jean embarked on the long training on the RF5 at Bawdsey Research Station at Bawdsey Manor. Bawdsey Manor was home to the very first Chain Home station .This is where the first RAF air exercises using radar were conducted in 1936-1937. By the outbreak of the war, the station was developed to the RDF training school. Poppa Jennings gave Jean’s group members their very first lectures on Course 6, courses 1 to 5 having been given before the war. With training complete, Jean received the ID: – 890144 – and was stationed firstly at Pevensey, secondly at Rye and her postings after that included a return to Bawdsey as an observer. 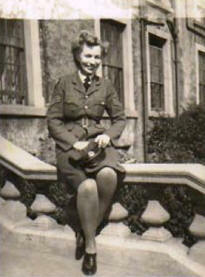 She also served on the Isle of Man and at Douglas Wood. 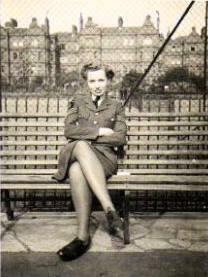 Her initial job-description was WAAF Special Duties. At the outset of hostilities the UK shortened the term ‘Radio Detection and Ranging’ to ‘Radio Location.’ When America came into the war they required the acronym ‘Radar’ to be used instead. At this point Jean and her colleagues became known as Radar Operators. The type of Radar Jean worked on was called CH which stood for Chain Home. Chain Home was literally a chain of radio detection stations spaced twenty miles apart around the coast. At the outbreak of war in September, CH had eighteen stations covering the eastern and half of the southern coast of Britain, more stations being added later. Information from the stations was passed to RAF Fighter Command Headquarters located in Stanmore in North London. The initial Chain Home used High Frequency (HF) wavelength meaning that it required large antenna masts to radiate sufficient power. 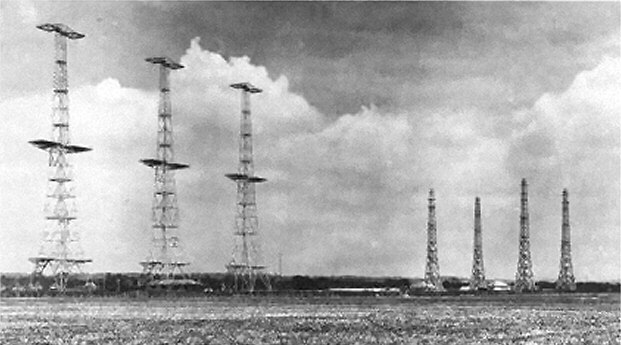 Its four, 360-foot-high transmitter aerials were made of steel, while the four, 240-foot-high receiver aerials were of wood. The transmitter aerials sent pulses of radio energy, at varying heights, which, when reflected from an aircraft, were picked up by the receiver aerial. In the receiver room, the distance of the ‘echo’ could be measured on the face of the cathode ray tube. Establishing the position of the aircraft was a more complex matter. The device used for this purpose was a Goniometer, known as a Gonio, with coaxial cables leading to four coils that could be sensitised. With the help of this device, the position of the target could be ascertained through triangulation from other stations. When a signal was transmitted, if there was an aircraft in the area, the body of that aircraft would bounce that signal back. If the signal stayed on the same bearing that would be great but if it kept changing all the time the observer had to react to the plane’s every move. In the view of Jean and her colleagues, the Spitfire returned the clearest signal of all aircraft being tracked at the time. ‘Visualise the cathode ray tube. Running across its screen was a thin, horizontal green line. This was your time base. Fixed to the outside of the screen was a strip of Perspex, looking rather-like a ruler. This ‘ruler’ measured distances from 0 to 200 miles. Using the DF (Direction Finder) Jean would go to-and-fro through the time base, swinging the Goniometer to determine mileage and find bearings. The further away the blips, the wider she needed to swing. She’d be aiming to reduce the blips in length, until she could hold them right on the line. One of the problems of the early Chain Home operations was the system’s inability to direct the transmitter signals, which made it impossible to establish if the tracked aircraft was flying at the calculated distance in front the radar chain, meaning over the sea, or behind it – inland. Early in the war, this caused a lot of confusion and unfortunate incidents. Jean describes the solution to this problem. There was also a lot of working out on paper and there was what eventually proved to be a hit or miss formula for determining the height of a plane that you were plotting. Radar operations were conducted under the veil of strict secrecy. In the case of invasion, operators were given revolvers. Should the station be endangered by the enemy, they were to fire the revolver at the screens, rendering them useless. In the beginning, each radar station also had an acid bath – a lead, acid filled tank kept close to operations. In the event of invasion all maps and other sensitive material was to be thrown into it. On one occasion, Jean decided to try the system out. She threw some obsolete documents into the tank. The papers went in white with black lines on and came out dark-greyish with clear white lines on. The system was found wanting by testers, and subsequently removed from all stations. Dear Katherine and Jean – fascinated to read this. My mother, then Mercia Lovett, was a radar operator on Romney Marsh n WW2 – I ssume this was RAF Rye asi t seems the only likely candidate. I know it’s a long shot, but see Jean was there at one time. I know it’s 70+ years ago but I wonder if Jean remembers the name of any of her colleagues there. My mother married David Griffiths, an RAF sergeant, in June 1945 at Willesborough Parish Church in Ashford. Sadly Mum died in 1966 and so I never got around to asking her the questions that I now wished I had. Hello I am looking for any memories of Coastal Radar Stations in Somerset. Particularly in the Minehead, Wachet , Ilfracombe areas. I am aware of the Northhill site but any 2WW and Cold War information would be greatly appreciated inlcuding and especially Northhill.